Leica Apo-Televid scopes are back! Those familiar with the sport optics market may be aware that one of the most iconic high-quality spotting scopes, the Leica Televid, has not been commercially available for some years now. Why is sort of outside the scope of things here but the result was that many dedicated Leica fans were either forced to make do with something else, or left with a long wait. Well, the wait is over! Leica has come out with their new Apo-Televid scopes with pure fluorite crystal, 82-mm objective lenses (at this writing, the 65-mm versions aren’t available). This isn’t the old Televid scope continued. This is something new and significantly better. We received the angled version of the Leica Apo-Televid 82 for evaluation and after conducting exhaustive testing, we are looking for new ways to avoid returning it to Leica. This is one fabulous spotting scope! To begin with, the new Televid features four fluorite lens elements, which increase the light yield by 6% according to Leica literature. We think they are underselling it. The difference in the intrinsic light gathering of an 82-mm objective lens versus a 77-mm one is 6% by itself, without taking into account the higher efficiency of the lens material, or improvements in the coatings. Let it be said right here: the new Televids are incredibly bright, significantly brighter than any scope we tested with an objective lens diameter of 85 mm or less. But that barely scratches the surface of the changes relative to the old Televids. Leica put an optically neutral piece of glass in front of the objective lens to protect the fluorite optics from damage in the field. Additionally, all exposed glass surfaces on the scope receive the AquaDura™ water- and dust-shedding coating. Still the joy of using this scope isn’t just in the image brightness; it’s in the stunning clarity, the vivid colors, and the razor-sharpness of the view. There’s no adequate way to describe this – you just have to see it for yourself, but short of that, trust us: the view through the Leica Apo-Televid 82 is lush and gorgeous. Currently, only one eyepiece is available for the new Televid though Leica plans to have more. Fortunately, the lack of choice is compensated for by the fact that it’s a marvelous one: Leica’s new 25-50x wide-angle, aspherical, zoom eyepiece. Most spotting scope zoom eyepieces range from 20 to 60x magnification, so for those of you hung up on numbers, this one is not as powerful. Experienced optics users will tell you that most zoom eyepieces really aren’t that good up at the 60x end of their range, and frequently, atmospheric conditions prevent the high magnification from being useful anyway. With this unique, wide-angle zoom, you just aren’t going to miss the extra range. We haven’t seen any data for the field of view of the Apo-Televid 82 equipped with the 25-50x zoom eyepiece, but we noticed in field trials that it outperformed every other eyepiece-scope combination we tested it against for useful field of view. Frequently, this eyepiece at 25x had a wider field of view than standard zoom eyepieces at 20x. This scope/eyepiece combo shows you more of the world than almost any other. Additionally, the Apo-Televid 82 scope has one of the shortest close focus distances we’ve ever seen in a scope, able to sharply focus on objects just 12 feet away! The eyepiece has a comfortable rubber eyecup that adjusts to four stable positions with a simple helical twist. The eyepiece itself is sealed and nitrogen-purged, and is waterproof up to a depth of almost 10 feet. Lastly, Leica has re-designed the eyepiece mounting system, going to a convenient and secure locking, bayonet mount, so when additional eyepieces are available, switching between them will be a breeze. 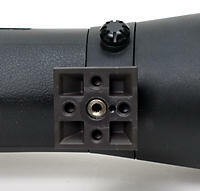 It should be noted that the new Televid eyepieces are not compatible with the old Televid 62 and 77 scopes. One thing that didn’t change from the old Apo-Televid spotting scopes is the dual focus mechanism. 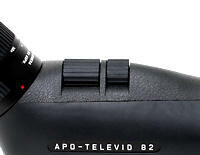 The Apo-Televid 82 has two focus knobs with differing ratios. 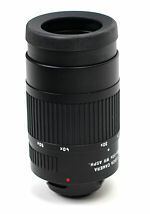 The smaller knob, closer to the objective lens, is the fine focus, while the wider knob, closer to the eyepiece, is the coarse focus. When you turn either knob, both move simultaneously. The coarse focus moves you rapidly from minimum close focus to infinity and the fine focus brings the target in sharply. Very sharply! For those unfamiliar with a dual focus system, it may take a little getting used to. Once you are used to it, other focus mechanisms will seem awkward by comparison. This one is really well executed. For those familiar with the old Televid scopes, the new Apo-Televid 82 looks a bit different. Gone is the metallic silver look with black accent stripes. The new Televids feature a magnesium body coated in black rubber armor. To house the larger objective lens, the barrel flares more, so it isn’t quite as sleek looking. The lens hood slides out easily but stays firmly in place until you collapse it. The scope body is fully sealed, and can withstand submersion to depths of almost 16 feet. The rubber armor and large objective lens come at a price, which is weight. We measured the weight of the eyepiece/scope combo at 71.2 oz, or about 4.45 lbs. The angled version was slightly less than 16 inches long and about 4 inches wide on the objective end. Like all angled scopes these days, the tripod-mounting bracket is attached to a ring with a set-screw that permits the scope to be rotated 360° around. There are firm detents every 45° to stabilize the most commonly used positions. One other little trait that we liked: the weight of the scope is perfectly balanced at the point of the tripod-mounting bracket: when you sit the scope down on the bracket, it never wobbles or tilts – it just sits firmly in place. This is beautifully designed. With a scope of such magnificent image quality, all the digital photographers will be wondering whether or not it can be adapted for digiscoping. Leica designed the Digital Adapter 3 to fit both the Apo-Televid 65 and 82 spotting scopes. This adapter is essentially the same as the Digital Adapter 2 with the added ability to fit either the old or new Televids. It will accommodate most point-and-shoot cameras by clamping around the top and bottom of the camera. Just announced but not shipping as we published this review, is Leica's Digital Adapter 4, which allows Leica’s D-Lux 4 camera to attach directly to the eyepiece. The Digital Adapter 4 will not work with any other camera. As of yet, there is no adapter available to connect an SLR-type camera. The scope comes with an objective lens cap that is held in place by two firm pinch clips and a separate cover for the bayonet mount. Unlike some systems, we never accidentally dislodged this cap in the field, again an indication of good design. The eyepiece comes with caps for both ends. The hard plastic eyepiece cap fits firmly on the rubber eyecup and is easy to put on or remove. The Apo-Televid 82 is not supplied with a case – that has to be purchased separately. Strictly speaking, a case is not required given that the scope is fully water- and dust-proof, and the rubber armor is sufficient to protect it from most bumps. But if you want to keep it looking nice, you may want the case anyway. Cases for Leica Apo-Televid scopes may be purchased for about $289.00. We did not receive a case for evaluation and so we cannot say much about it. The tripod-mounting bracket itself reveals another of those nicely thought-out details so typical of Leica. The bracket is designed to fit any standard quick-release plate from most major tripod manufacturers. The bracket takes a standard tripod screw thread, but has holes forward and back and to both sides to accommodate the pin from the quick release plate, so you never have to move the pin to position the plate for the best fit on the tripod head. There is even a non-standard, extra, smaller pin hole on the objective lens side of the bracket, presumably for another type of plate mount. As might be anticipated, this kind of optical quality does not come cheaply. 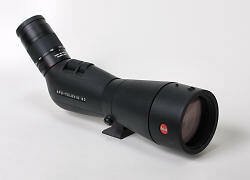 The Leica Apo-Televid 82 spotting scopes cost $3,899.00 for either the angled or straight body, and $900.00 for the 25-50 wide-angle, zoom eyepiece. This is not a scope for the casual user who just wants to see something. This is a scope for the serious users who want the best view possible from one of the most sophisticated optics on the planet!